One of the biggest dilemmas that most fashionistas have is what to wear for a traditional function. It is given that an ethnic outfit would be expected. However, now the boundaries are blurring as the fusion wear is the latest trend. 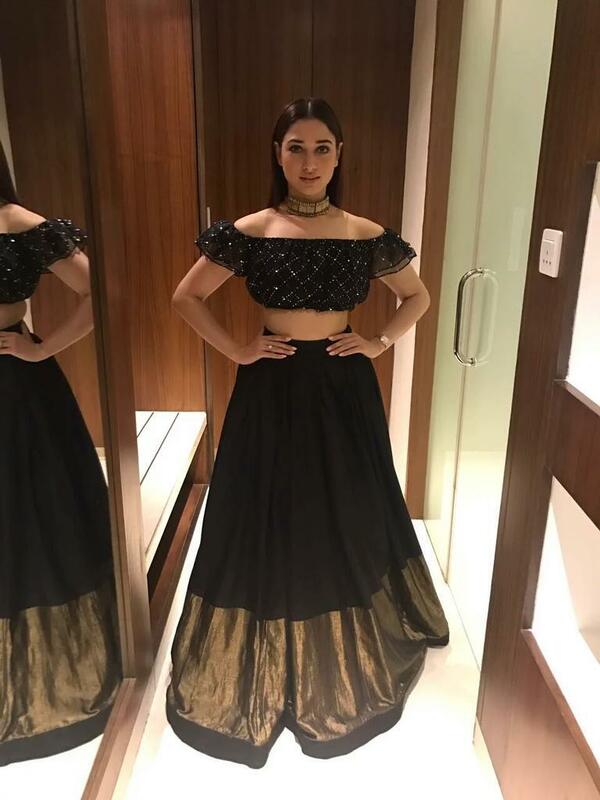 Everyone is jumping on the bandwagon and fashionista Tamannaah Bhatia is showing the way. Let’s take a closer look at what she wore and how she wore it! Happy reading. Recently, Tamannaah was spotted at a Dahi Handi event in Pune. She sported a chic black lehenga and a crop top. The matching top had embellishments made it look grand but not to gaudy, designed by Nikita Mhaisalkar. And it goes without saying that the black and gold combination worked like a charm. The fashionista looked gorgeous in the ensemble! As for her hair and makeup, it was spot on and perfect for the occasion. Keeping it natural was the best way to go. She selected statement jewelery from Aquamarine. If you like this article, spread the love by sharing it with your friend. Don’t forget to subscribe to our website for the latest style updates. Stay stylish! Really amazing. As usual, Tamannah is looking gorgeous in this wavy black gown!